Crisis panel head: How did Wall Street miss it? WASHINGTON (CNNMoney.com) -- Phil Angelides says he just doesn't get how Wall Street executives say they never saw the financial crisis coming. The head of a federal panel charged with determining what caused the meltdown says the proof was sitting in plain view -- in places like Florida and California where bad and even fraudulent home loans were being made by the bucketful. The big banks knew full well what was going on because they were buying the loans. Angelides runs the Financial Crisis Inquiry Commission, which has recently spent time talking to those on the frontlines of the housing crisis in Las Vegas, Miami and Bakersfield and Sacramento in California. Among the discoveries: As early as 2004, the FBI warned that an "epidemic" of mortgage fraud would cause a crisis if not contained. 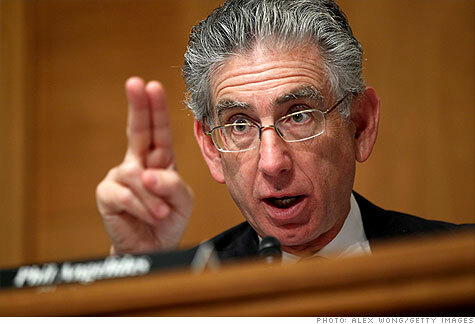 "It's been eye-opening," Angelides said in an interview with CNNMoney. "We've heard for a year how folks on Wall Street and people in Washington didn't see it coming." The 10-member, congressionally-appointed panel is now in the home stretch. It has until Dec. 15 to issue a report that it hopes will be be the definitive word on what caused the financial crisis. The commission has held a dozen public hearings, conducted hundreds of interviews and collected thousands of electronic records and documents, sometimes by force of subpoena. But now the commission has to drill down and come to a consensus on what potential cause was the most damning and worth singling out in a 400-page report. "Our great challenge has been narrowing down to the elements that were essential to the crisis," said commission member Douglas Holtz-Eakin, a former Congressional Budget Office director. "There are elements that may have made things worse or exacerbated it slightly but weren't a big cause." Take the recent slate of field hearings. Both Angelides and another commissioner, former Florida Sen. Bob Graham, have said that the testimony they heard from local law enforcement officials has convinced them that corruption and fraud played a major role in causing the crisis. "Mortgage fraud is not just a side issue -- in many ways it's a central issue of this financial collapse,'' Graham told the Miami Herald after the Sept. 21 hearing in Miami. But not everyone is so convinced of the significance of corruption. "Clearly there was fraud and clearly, you don't want it to continue," said commission member Keith Hennessey, who was director of the National Economic Council under former President George W. Bush. "I just don't know how high it ranks in the range of factors, because there are a lot of forces that caused or contributed to the crisis." The pressure is on the commission to produce a final report that becomes a best-seller like the report of the commission that investigated the Sept. 11 terrorist attacks. The need to produce is especially acute, because the panel blew through its initial $8 million budget and had to ask Congress for $1.8 million more. It has lined up publisher Little, Brown and Co. to print a paperback copy of the report and plans to release an "enhanced" electronic edition for e-readers that will include hyperlinks to additional documents. And when the final report comes out, the commission plans to release reams of records and reports on its Website, Angelides said. Until then, it has a lot of work to do, members said. The panel also has a few few outstanding requests for documents at several big banks, including Goldman Sachs, Angelides said, without giving specifics. And it is still tussling with Rep. Darryl Issa, the ranking Republican on the House Oversight committee who has complained about the panel's spending, management and staffing. Angelides said that Issa's claims are "bogus." In a letter to Issa, he explained that the panel needed the extra funding to meet its mandate by "engaging additional investigators, researchers and report writers," and expanding its computerized document analysis resources. Issa wants a congressional inquiry. "If they had nothing to hide, then they should have no hesitation in providing is with the information we requested," said Issa spokesman Kurt Bardella.